It’s that time of year again ladies and gentlemen. 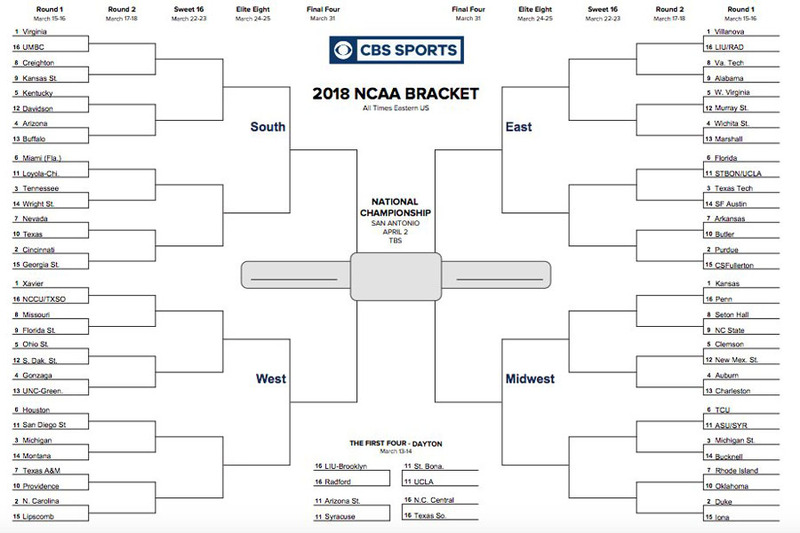 Time to fill out brackets in the hope of winning money–or bragging rights–for a perfect bracket. Over 70 million people filled out March Madness Brackets last year and this year two Rampage staff members made the following predictions. This game was the hardest pick to make out of all the first round games. Oklahoma has the best player in college basketball, point guard Trae Young, who leads the country in points AND assists per game. However, Oklahoma has lost 11 of their last 15 games and the rest of their team is made up of sub-par players. Rhode Island on the other hand, is a solid all around team and is in the top 10 turnover forcing teams in the league. They’re also coached by the talented Bobby Hurley who will have his team well prepared. The edge goes to Rhode Island in this matchup. Numbers never lie, so there needs to be at least one 12 vs. 5 seed upset. In 29 of the past 33 years, at least one no. 12 seed has upset a no. 5 seed. There’s nothing in particular I love about New mexico state, but Clemson is the weakest team out of all the 5 seeds in this year’s bracket. The only concern with New Mexico state is their poor free throw shooting, which could cost them late in games. Alabama will win this matchup because of one player: point guard Collin Sexton. In his conference tournament, he dropped 27, 31, and 21 points against Texas A&M, Auburn, and Kentucky, respectively. These are all teams that are highly seeded in this year’s tournament, not to mention he faced double teams repeatedly throughout the game. Virginia Tech is no push over, they beat no. 1 seed Virginia, 2-seed Duke, and 2-seed North Carolina during the regular season. While Virginia Tech is the logical pick, I can’t pick against Collin Sexton in this first round matchup. Arizona is overhyped. Period. I can’t say star center Deandre Ayton isn’t a beast inside, and that they don’t have shooters on the perimeter, but Arizona plays the schedule comparable to a mid-major conference school. The PAC-12 only has two other teams in the tournament, and they’re both 11 seeds who have to play the First Four play-in game. Not to mention this Kentucky squad is currently hitting its stride; they just ran through the SEC tournament and have a group of freshman starting to gel at the right time. Sorry to all the Arizona lovers, Kentucky is going to bust your bracket in this second round matchup. 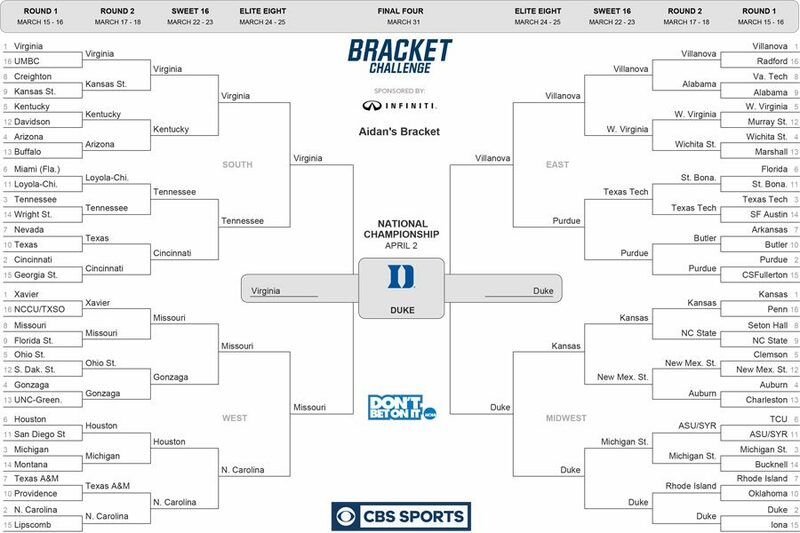 Before you judge my bracket for a no. 8 seed beating a no. 1 seed, here me out. Missouri has arguably the best player in college basketball coming back for this tournament. Small forward Michael Porter Jr, the no. 2 recruit in the country, had a back injury the first game of the season that kept him out all seasona��until last week. Porter returned to the floor in the SEC tournament and in limited minutes put up an impressive 12 points and 8 rebounds in his first full game all season. Insert the phenom into a lineup that already shoots a deadly 40 percent from three-point land, and that cooks up a nice upset cake. As much as I love “press Virginia,” I can’t see them taking down the Wildcats. West Virginia’s whole scheme is based on turning the other team over, and Villanova is in the top 15 in the country at protecting the ball. Moreover, Villanova is a perfect 4-0 against top 25 ranked teams this season, while West Virginia has 6 losses to ranked teams. Chalk it up here for “nova. This game gives me the jitters. These teams matched up earlier this season, and Duke won a close game by seven points. While Duke is going to persevere to the next round, this is the toughest matchup Duke will face all season. Michigan state is littered with talent, as they have two NBA lottery picks in Miles Bridges and Jaren Jackson Jr, not to mention Hall of Fame coach Tom Izzo. Duke has five legitimate NBA first round picks in its starting lineup, which is unheard of. Not to mention Duke has twin towers Wendell Carter Jr. and Marvin Bagley. They also have sharpshooters Grayson Allen and Gary Trent Jr. who will make any team pay for sending a double team down on Bagley in the post. While Michigan state will be the hardest challenge of the season, Duke is too loaded to lose this game. I gotta keep rolling with the Tigers in this matchup. UNC is definitely the favorite, but they’re going to slip up sometime this tournament. North Carolina has an astronomical numbers of losses for a no. 2 seed–10 to be exact–which means they can be beat by a lot of different teams. While they have the tools to make a run in this tournament, I can see Michael Porter Jr dropping a cool 25 points en route to a hot shooting performance by the rest of the Mizzou perimeter that ends up with the tigers cutting down nets on their way to the final four. This game could be the lowest scoring of the entire tournament. Virginia and Tennessee both play slowed-down, half court basketball that relies on getting defensive stops and rebounding. Forward Admiral Schofield is a man among boys on the court who should pose serious problems for Virginia’s interior D. But these two teams play the same style of basketball and nobody plays this old school style of basketball better than Virginia. This will again be an intense game down to the buzzer, because “nova is another team that could dash the blue devils’ hopes. Villanova is experienced and led by stud point guard Jalen Brunson, who can lead an offense by himself. “Nova is only a year removed from celebrating a national championship, and they are hungry to get back to the big dance. Duke’s saving grace in this game will be their height. Villanova’s tallest player is 6a��9″, and Duke boasts two 6a��11″+ giants in the paint. Duke also has longer guards as their point guard is 6a��5″ and their small forward at 6a��6”. This should be enough to disrupt the Wildcats ball movement and advance Duke to the national championship. This is it. The big game. This game is really a toss up; it’s the best two teams in the country matching up for one game that decides the whole season. The edge goes to the Blue Devils one last time. Virginia has undoubtedly the best defense in the country, which will stifle any team that comes in its path. While they play “straps” defense, there offense isn’t exactly a well-oiled machine. Most of the offense relies around combo guard Kyle Guy, who can shoot the three with any player in the country. My deciding factor is purely the more talented team, because in the last three minutes when the game is on the line, the Duke stars will be able to go straight isolation basketball and get the buckets they need at the end to call themselves national champions, as much as it hurts me to say that as a Terps fan.